Since the Justice and Development Party’s (AKP) accession to power, urban development and transformation projects are undertaken in the country, restructuring dramatically social, political and cultural morphology of cities in Turkey. Urbanisation and housing policies in Turkey since the early 2000s present some characteristics leading many researchers to qualify them neo-liberal. Much research, particularly Anglo-Saxon ones, highlights a progressive neoliberalisation in this area since the 2000s. This phenomenon results, according to geographers Marianne Morange and Sylvie Fol, on “the agreement of many cities to develop urban entrepreneurship in order to rise their attractiveness to face the international. It is accompanied by an abandonment of spatial planning to the benefit of the new competitive regionalism embodied in a strategic urban planning” (2014: 2-3). Social policies in the city and the search for spatial justice fostering social diversity and support for disadvantaged populations are gradually downgraded. This paper would discuss this process by analysing urbanisation process in Turkey especially during the AKP’s rule. The objective will be also to show the specificities of this neoliberal urbanisation nourished in some ways by the taste of AKP government for conservative way of life and Ottoman period. Urbanization can be explained through to three historical phases; the period before 1980, the period between 1980 and 2001, and the period after 2001. The first phase corresponds to the beginning of urbanization in the 1950s, and it is clearly related to the high rate of rural migration (Öncü, 1988). This period is marked by the absence of public policy on housing. The housing question was never entirely addressed as a policy in the political agenda of changing governments, and housing needs was long-time managed by individual initiatives by constructing informing settlement called generally as gecekondusin Turkey (Türkün, 2011). As Kuyucu and Ünsal argue, “in the absence of a formal social housing policy, the informal market became the only mechanism to cater for growing urban populations. This particular solution to the “housing problem” was used extensively in Istanbul, where housing provision for low-income groups relied on the legalized appropriation of unauthorized land” (Kuyucu and Ünsal, 2010: 1483), resulting in the expansion of inner-city gecekondu areas. In Istanbul, this act of land taking was by no means legal, but was nonetheless sanctioned as it allowed the government to pass the costs and political hur­dles of urbanization on to the migrants themselves. In doing so, businesses were able to disregard hous­ing expenses when calculating labour costs and poli­ticians could tie votes to the provision of land alone (Lelandais, 2014). This arrangement was accepted as long as these new­comers provided themselves the needs for their own welfare like grow­ing food in their own courtyards and walking to jobs in nearby industrial factories. They were therefore able to reduce the costs of urban living. During the 1980s and 1990s gecekondus started to change owners in order to construct buildings, making possible for the first dwellers to increase their life standards. The introduction of neoliberal economic rules started in Turkey during the 1980s. The control of the state was progressively reduced on markets and services under the rule of former Prime Minister Turgut Özal. In terms of anti-labourism and neoliberal centralisation of state power, Turkish government under Özal engaged in real shock therapy as its counterparts did elsewhere in Europe accompanied by an export-led growth strategy (Bekmen, 2014: 54). During the period between 1980 and 2001, economic development dominated Turkey’s public policy, and lead to the emergence of large-scale development projects such as the Southeast Anatolia Project (GAP), which involves the construction of 20 barrages and irrigation channels. This era was also associated with the development of building co-operatives and the introduction of larger building contractors within the housing market. During this period the Real Estate Investment Trusts were beginning to influence the housing market, and they identified inner-city gecekondu areas as potentially profitable sites. Before the rise of AKP, previous governments had not attempted to regenerate gecekondu areas, fearing a backlash from voters and subsequent electoral defeat. This view was only changed by two major crises in Turkey, the first being the major earthquake of 1999 in the Marmara Sea close to Istanbul, which caused the deaths of 16,000 people and the destruction of 20,000 buildings. This was closely followed by the 2001 financial crisis that provoked a considerable political and economic change leading to the AKP. Jesse Honsa is an architect based in Istanbul. Born in the United States, he holds degrees in Architecture and Fine Arts from the Rhode Island School of Design, and has practiced in New York City, Zurich, and Istanbul. His design work and writing focuses on authoritarian planning and resistance, speaking at TEDxReset in Istanbul and the World Islamic Economic Forum in London. Ironically, these isolated enclaves are sprouting up at a time when Istanbul is transforming into a metropolis without limits. New roads, bridges, subways, tunnels, airports and canals are being cut through tightly-knit claustrophobic neighborhoods, bulldozing the barriers to neoliberal exchange. Gated communities and other introverted spaces dutifully maintain order amidst this urban maelstrom, walled off from the discord of an endless and rapidly transforming city. Plans of enclosed garden developments in Istanbul. Drawn by author. Over 1,000 gated communities have been built in Istanbul in the new millennium, taking on various forms and marketed for their safety and social facilities. But in reality they are not communities and nor are they even particularly gated. The city’s crime rate is equally low inside and outside such enclaves. Marketed to wealthy Turks as well as to Arabs, Russians, and Westerners, there is very little holding the community together besides a common tax band. Residents rarely even know their neighbors. Behind the verdant renderings of happy gardens and fountains, exclusivity is the hidden agenda, one that manifests itself in a Dubai-like architecture seemingly calculated for maximum alienation. Batışehir: A continuous band of housing wraps around the garden, with occasional incisions. By DB Architects. You can find American-style fenced-in suburbs along Istanbul’s periphery, but gated communities have evolved into a new type as they have increasingly begun to encroach upon the urban core. Smaller parcel sizes and higher FAR (Floor-Area Ratio) result in enclaves that are compact, tall, and completely at odds with their immediate surroundings. What began as loose sprawl congeals into a thick, concentrated mass, where hard edges abound. The Turkish word for Gated Community is site, from the French cité, and they generally resemble the French highrises of the same name, rather than American tract housing. Towers and slabs stand shoulder to shoulder, dancing in a circle around the gardens they surround. Beyond these residential communities, the enclosed garden has become the modus operandi for architects and developers regardless of program: schools, hotels, offices, and government facilities, all follow a similar principle. It is a methodology that utterly negates context: in a rapidly transforming sea of anomie, introversion is apparently the only way to make space. Park Bosphorus Hotel, central Istanbul. The logic of the ex-urban gated community invades the urban core. Multi-use complexes are frequently marketed as cities unto themselves. Like prepackaged TV dinners, they contain all the essential ingredients of a deliciously unhealthy urban meal, but invariably lack the home-cooked delights of an incremental urban growth. One recently completed high-profile project in downtown Istanbul, the Zorlu Center, boasts shops, offices, residences, a hotel, and a theater for the performing arts. Despite its hermetic enclosure, the architects somehow refer to the courtyard as a “public space” and a “town square.” Surrounded by highways, the easiest way to reach the complex is by an underground tunnel that connects to the metro system: modern infrastructure links isolated architectural forms, while flagrantly omitting the free-roaming pedestrian’s role in the production of truly public space. The Zorlu Center, by Emre Arolat Architects and Tabanlioğlu Architects. * Raze a blighted industrial site or neighborhood close to the city center, preferably along a new highway or metro line. * Build an access road around the perimeter. Like a castle moat, this isolates your project from context and gives distance for height setbacks. * Fill the offset parcel with a base. This plinth elevates the garden while providing parking underneath. * Arrange towers and blocks along the borders of the site, maximizing the area of the captured central garden. * Stand out from your neighbors with shiny materials. * Market the project with a name that sounds like a car, i.e. ‘Innovia’, or ‘Quasar’. Kavakli Residences, a typical housing project in Istanbul. Stair cores arranged towards the street, with living rooms and balconies oriented to the courtyard. A base elevates the courtyard above street level. Plans redrawn by author. Autonomous four-walled enclosures in Bursa, Turkey. These walled spaces played an important role in Istanbul’s history. Following the Ottoman conquest of then Constantinople in 1453, the Sultans constructed grand monuments on top of old Byzantine plazas and forums. These mosques and Külliyes (multi-functional complexes) replaced urban squares as the civic realm of the city and the nuclei of urban development. 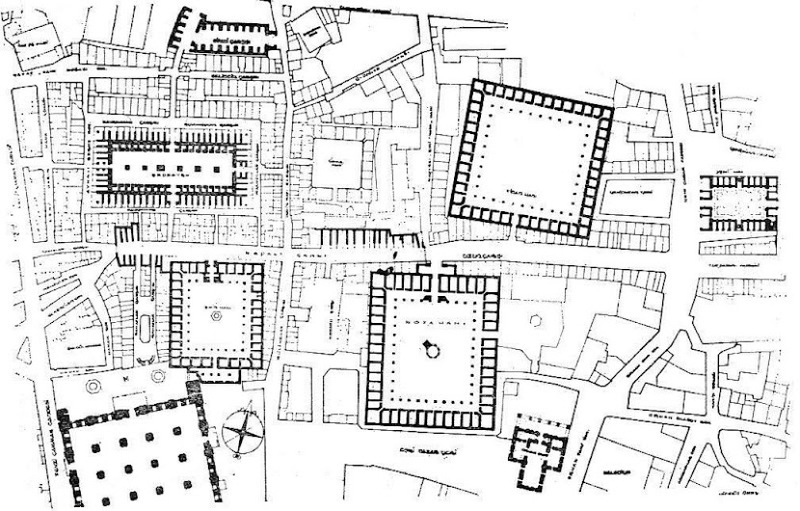 A relaxed building code transformed the gridded, porticoed example of Roman urban management into an organic network of cul-de-sacs; yet public space was well-ordered within these monumental enclosures. From the domestic garden, to the local mosque, to a district’s central Külliye, Ottoman life was often framed by singular pieces of architecture. As opposed to our binary understanding of inside and outside or private and public, social relationships were defined by the walls that form a community. Sülemaniye Külliyesi, a complex of mosque, hospital, primary school, baths (hamam), caravanserai, Quran schools (madrassa), medical college, charitable kitchen, and mausoleums. The struggle between the urban and the architectural has been acted out across Istanbul’s long history. In the Tanzimat (reform) Period of the 1800’s, European architects and planners reintroduced the grid and the square to the Ottoman capital. Frequent fires created new opportunities to rationalize the city’s parcel plan, and resulted in tighter urban codes for building materials and setbacks. In the early Turkish Republic of the 1920’s and 1930’s, French Urban Planner Henri Proust cut through Istanbul with boulevards, squares and parks, a sort of Hausmannisation of the ancient city. In one of these interventions, Proust demolished an Ottoman military barracks to make Gezi Park, now world famous as the stage for the Gezi Park protests that rocked Turkey in 2013. Outcry erupted when plans emerged to resurrect the historic barracks as a mall, hotel, and/or other program of neoliberal excess at the cost of green space. As part of alarge-scale tunnel project through Taksim Square, the tag-team of infrastructure and architecture ambushed urban space. The barracks (literally a caravanserai, or “house of the army” in Persian) would not have actually destroyed the park, but rather it would have enclosed it. As if prompted by agoraphobia, the government sought to capture space again with the inhabited wall. Behind all the struggles between free speech and authoritarianism, lay the conflict between a universal cosmopolis and a walled paradise. The rebuilt Ottoman barracks would have captured Gezi Park behind its four inhabited walls. Gezi Park Protests, 2013. Police protect a monument. In the case of Gezi Park and elsewhere, Ottoman heritage is used as a means of drumming-up consensus around controversial projects. The economically liberal, religiously conservative AKP government has opened up Turkey to the global economy, and opened up Istanbul to new development with its infrastructural megaprojects. Far from traditional Islamic urbanism, their city is one of continent-connecting-bridges, escalators and mobile broadband. But in the absence of an urban political structure capable of regulating public space, Istanbul becomes an archipelago of framed Edens. This might very well be the future of all cities. As city walls and state boundaries erode under late capitalism, the walls are only rebuilt at a smaller scale to maintain immunity from the chaos outside. What was once traversable space becomes fragmented. Large-scale architecture, now in an alliance with infrastructure, has defeated the notion of urban space. writing focuses on authoritarian planning and resistance, speaking at TEDxReset in Istanbul and the World Islamic Economic Forum in London. Fin de l’ère AKP ? *Pour les lecteurs ne connaissant pas les partis politiques en Turquie et afin de mieux comprendre l’article, je présente, dans un premier temps, les organisations entrant au parlement le 7 juin 2015 et leurs orientations. AKP-Parti de la Justice et du Développement, droite-conservatrice, néolibérale, islamiste. Au pouvoir depuis 13 ans. Recep Tayyip Erdogan est son ancien président; il est actuellement dirigé par Ahmet Davutoglu. CHP-Parti Républicain du Peuple, centre gauche, kémaliste, social-libéral, progressiste. Historiquement fondé par Mustafa Kemal Atatürk, le CHP s’est engagé depuis quelques années dans une voie progressiste, davantage pluraliste et plutôt non-offensif avec le mouvement kurde. Il est dirigé par Kemal Kiliçdaroglu. MHP-Parti du Mouvement Nationaliste, extrême-droite, conservateur, ultranationaliste. Il est dirigé par Devlet Bahçeli. Ce parti est opposé à toute négociation sur la question kurde. HDP-Parti Démocratique des Peuples, gauche progressiste et radicale, antilibéral, pro-kurde. Ce parti a pour base le mouvement kurde. Interdit et transformé plusieurs fois, il est parvenu à réunir les forces de gauche du pays avec le mouvement kurde afin de participer aux élections du 7 juin. Il est dirigé par Selahattin Demirtas. Les Turcs aiment le débat politique. Chacun émet un avis sur chaque parti politique et son leader. Cet intérêt pour la politique atteint parfois des niveaux surprenants ; ainsi, très souvent, on peut se retrouver avec un chauffeur de taxi, un épicier, une vieille dame dans un bus souhaitant engager une discussion politique avec vous. Actuellement, cette politisation passive est à son paroxysme, suite à l’élection par les Turcs de leurs futurs députés. Depuis une semaine, je circule dans les rues d’Istanbul. Je tente d’écouter les discussions. Dans les bus, les cafés, les bateaux, les magasins et les parcs publics, on ne parle que des résultats électoraux. Certains en parlent avec l’enthousiasme, d’autres sont déçus. Une partie ne parvient pas à comprendre comment le HDP a obtenu un tel succès. La Turquie a vécu cette élection dans une ambiance sensiblement différente des autres scrutins. Les relations étaient tendues entre les différentes structures politiques. Le parti au pouvoir était dans l’offensive contre l’opposition. Les partis d’opposition, notamment le CHP et le HDP optèrent pour un discours pacifiant. Les arguments économiques ont dominé la campagne. Cependant, pour la première fois, un président de la République, sensé rester neutre à l’égard des partis politiques, a explicitement demandé de soutenir l’AKP lors de meetings organisés, sous le prétexte d’inaugurations de bâtiments, ponts ou autre constructions réalisés par le gouvernement. Pour la première fois également, le Coran a été brandi sur des places publiques pour convaincre les masses. La campagne a également été dominée par une réelle violence envers le HDP. Plus de 160 bureaux de campagne de ce parti ont été attaqués, incendiés et ses militants blessés voire même tués (Lien). 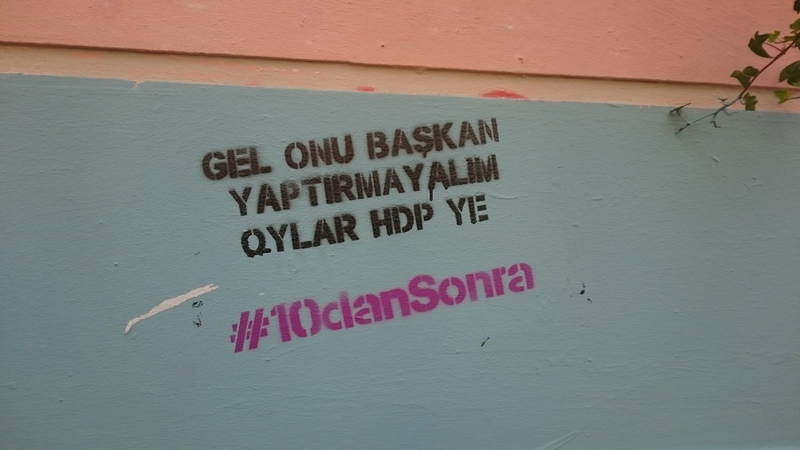 Cette stratégie agressive de l’AKP provenait de l’inquiétude de l’éventualité que le HDP parvienne à atteindre et dépasser le barrage national de 10 %, indispensable pour avoir des élus, et ainsi récupérer les sièges qui lui reviennent des mains de l’AKP. Il est vrai que le peuple turc ne s’est pas mobilisé cette fois-ci pour l’AKP. Plusieurs analystes se sont empressés d’affirmer que les électeurs ont ainsi voulu donner une leçon à leur gouvernement en le privant de sa majorité au parlement, indiquant leur volonté de voir se former un nouveau gouvernement basé sur le consensus, puisque ce dernier, au regard des résultats, sera très probablement une coalition. Cependant, si cette analyse est en partie vraie, elle néglige deux éléments importants. Le premier est le système électoral en vigueur et le deuxième la proportion du vote accordée à l’AKP. En premier lieu, le système électoral turc fait qu’il est difficile d’obtenir une majorité confortable au Parlement même en obtenant une grande partie des votes. C’est le cas de l’AKP. Avec 40 % des voix, ce parti n’a obtenu que 258 sièges sur 550, ce qui n’est pas la majorité absolue au Parlement. Cette situation provient de l’existence d’un barrage national de 10 % pour tous les partis politiques empêchant l’accès au Parlement même dans l’éventualité de l’obtention de la majorité dans une circonscription particulière, ce qui permettait jusque-là de barrer la route du Parlement aux petites structures politiques, notamment celles des kurdes. Instauré après le coup d’Etat militaire de 1980, ce système a servi conjoncturellement d’obstacle aux partis de la gauche radicale dans les années 1980 puis aux partis kurdes. De ce fait, pendant de longues années, le choix d’une partie de l’électorat turc n’a pas été représenté au Parlement, les grands partis étant les grands bénéficiaires de ce système. De plus, cette non-représentation a été considérée durant les années 1980 et 1990 comme une des garanties du régime kémaliste et laïc. Pendant les années 2000, l’AKP n’a pas souhaité supprimer ce barrage, malgré les promesses électorales, pensant préserver son pouvoir absolu au sein du parlement (les voix perdues du HDP -ancien BDP- se transformaient systématiquement en sièges pour l’AKP, qui restait toujours le deuxième parti dans les régions à majorité kurde). Les élections du 7 juin ont renversé ses calculs politiques. En dépassant les 10 %, le HDP a récupéré ses sièges au Parlement, privant l’AKP de sa majorité absolue. C’est donc essentiellement ce système avec un barrage élevé qui a mis fin à la suprématie numérique de l’AKP au Parlement et non seulement le vote du peuple. Ce constat nous amène au deuxième fait. Les électeurs turcs ont effectivement souhaité donner un avertissement à l’AKP mais pas forcément au niveau souhaité ou attendu. Il ne faut pas oublier que malgré toutes les accusations de corruption et les faits avérés concernant plusieurs ministres du gouvernement (on a trouvé plusieurs millions de dollars dans des boîtes à chaussures chez un de ces ministres lors d’une enquête policière entre le 17 et le 25 décembre 2013), le parti a néanmoins obtenu 40 % des voix dans une élection à 83,3 % de participation. Après 13 ans au pouvoir, on peut considérer cela comme un succès. De plus, dans un contexte extrêmement politisé où la corruption, l’exploitation des sentiments religieux, les discours polarisants et le mépris des représentants de l’AKP (un membre de l’AKP, par exemple, affirmant que les Kurdes n’étaient pas de vrais musulmans), les insultes vis-à-vis des minorités ethniques, notamment des Arméniens, la qualification des membres de l’HDP de terroristes et de l’ensemble des partis d’opposition de « croisés » contre le croissant, l’absence de proposition des politiques sociales et économiques n’ont tout de même pas entraîné une chute colossale des voix de ce parti. Les explications de ce fait sont à chercher dans les caractéristiques socio-culturelles de la société turque. Cette dernière reste majoritairement une société sensible aux valeurs de droite et relativement conservatrice, très attachée à sa religion et aux valeurs traditionnelles et familiales. La gauche, depuis le coup d’Etat de 1980, ne parvient que rarement à dépasser 35 % ; de plus, elle est très hétérogène. Le CHP qui est, en général, présenté comme parti social-démocrate, contient des traits fortement nationalistes, et le HDP a toujours une aile proche des valeurs islamiques. Autrement dit, l’électorat représentant une gauche telle qu’on l’entend en Occident ne dépasse pas 15 %. De plus, lorsqu’on regarde l’échiquier politique turc, l’AKP est le seul parti de centre droit, sans alternative. Il récupère, de ce fait, l’ensemble de l’électorat de droite ne se sentant pas proche de l’idéologie ultra-nationaliste du MHP. Les deux faits relatés ici donnent une idée pour l’interprétation partielle du résultat des élections, mais ne permettent pas de comprendre et d’analyser le succès considérable de l’HDP. Ces derniers jours, de nombreux articles dans les journaux européens comparaient ce parti à Podemos en Espagne et Syriza en Grèce. Certes, toutes ces organisations se nourrissent de la nature de plus en plus inégalitaire et injuste des sociétés actuelles et contestent également le système économique néolibéral, renforcé par la crise économique de 2008. Cependant, la raison de la percée de l’HDP est toute autre : il ne s’est pas formé suite à une crise économique et sociale en Turquie mais existe depuis 30 ans dans le champ politique, avec pour objectif de défendre les droits du peuple kurde. J’ai souligné au début de cet article que les élections du 7 juin étaient différentes des autres. Une des raisons pour avancer cet argument est l’émergence de l’HDP et la mobilisation de l’électorat de gauche autour de ce parti. Cette mobilisation a incarné les espoirs d’une partie de la société turque désirant une société libre, démocratique, tolérante et résolument anti libérale. Les élections du 7 juin sont devenues, aux yeux de cet électorat, une question cruciale, la dernière sortie avant l’instauration d’un régime autoritaire et sécuritaire dirigé et dominé par les ambitions personnelles de Recep Tayyip Erdogan. Ce constat n’est pas vraiment erroné puisque, depuis quelques années, les politiques et mesures anti-démocratiques du gouvernement se multiplient. De nombreux journalistes ont été accusés par le gouvernement de traitrise, de travailler contre les intérêts du pays, agissant avec des lobbies étrangers. La dernière loi sur la sécurité intérieure fut l’apogée de cette tendance car désormais toute mobilisation et contestation est considérée comme une menace à la sécurité publique, la loi permettant à la police d’intervenir sévèrement. La dernière enquête du journal Cumhuriyet prouvant l’aide du gouvernement à l’EI, photos de camions chargés d’armes et escortés par les membres des services secrets turcs (MIT) à la frontière syrienne à l’appui, s’est attiré les foudres du président de la République et du gouvernement. R.T. Erdogan a directement menacé le rédacteur en chef du journal, Can Dündar, d’une sanction sévère (Lien). 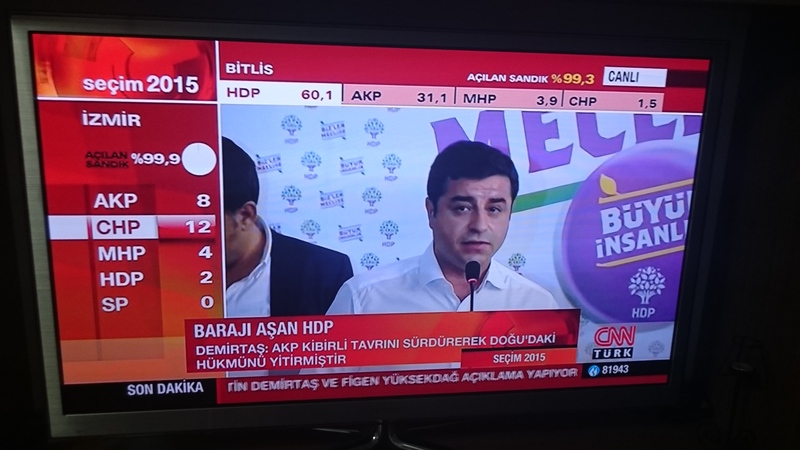 Cette révélation, qui n’est pas une surprise pour les Turcs, a autant diminué la popularité de l’AKP que renforcé la mobilisation autour de l’HDP. Ce soutien a atteint son paroxysme lors de l’explosion d’une bombe ôtant la vie à trois personnes lors d’un meeting électoral de ce parti à Diyarbakir. Au-delà de ces récents événements, la réunion des forces progressistes du pays autour de l’HDP trouve aussi ses origines dans la résistance du parc Gezi de juin 2013. Cette résistance sociale et politique mobilisant un grand nombre de citoyens turcs était la première mobilisation de masse contre l’AKP et s’est cristallisée autour de deux motivations majeures. Elle a réuni les segments de la société turque inquiets des orientations islamistes croissantes du gouvernement et du discours de plus en plus polarisant de Recep Tayyip Erdogan. Elle a également mobilisé des milieux qui s’opposaient déjà depuis longtemps aux politiques néolibérales du gouvernement focalisées dans l’espace urbain, transformant la morphologie socio-culturelle des villes et effaçant progressivement le mémoire urbaine (suppression des petits magasins historiques, transformation des quartiers autrement habités par des minorités chrétiennes, destruction des bâtiments historiques, des cinémas et des centres culturels, etc.). Ces politiques ont, en dix ans, entraîné le déplacement forcé de plusieurs milliers de personnes rien qu’à Istanbul. La destruction du parc Gezi fut la goutte d’eau faisant déborder le vase et elle a rencontré une très forte opposition de l’opinion publique. Les organisations, groupes et individus se considérant marginalisés, entièrement opposés à ces politiques et projets et ayant participé à la résistance du parc Gezi souhaitaient se réunir politiquement afin de barrer la route à l’AKP et aux ambitions de R.T. Erdogan d’instaurer un régime présidentiel. Si les partis politiques traditionnels, notamment le CHP, ont pu bénéficier de cette opposition, c’est le HDP qui a su canaliser ces mécontentements et offrir un projet politique répondant en grande partie aux aspirations des participants de Gezi. Il a su réunir les partis anticapitalistes, les militants écologistes, les féministes, les LGBTs, les minorités ethniques, les électeurs progressistes de gauche en plus des Kurdes. Il est parvenu à se présenter comme la seule alternative crédible pour enlever la majorité parlementaire à l’AKP. Prenant le risque de se présenter en tant que parti politique et non avec des candidats indépendants, il a réussi son pari et obtenu 80 sièges au Parlement. Le principal slogan de son jeune leader, Selahattin Demirtas, pendant la campagne, « Nous ne te laisserons pas devenir président », martelé constamment contre Erdogan, a galvanisé les masses et effectivement empêché ce dernier, pour l’instant, de réaliser son rêve. A l’heure actuelle, un climat de soulagement règne dans les rues stambouliotes. Pendant que les discussions politiques sur une coalition éventuelle débutent, les forces politiques progressistes de la Turquie fêtent leur première victoire politique, renforçant leur confiance, l’espoir et l’avantage moral face à un gouvernement jamais battu malgré son omniprésence et son caractère oppressif à toutes les échelles de la vie quotidienne. Cette victoire doit être considérée, cependant, avec prudence. De nombreux électeurs ont également voté pour le HDP non pas par conviction mais plutôt par stratégie d’affaiblir l’AKP. Compte tenu de l’expérience d’Erdogan dans le jeu politique, il faut également se méfier de ses manœuvres politiques pouvant aboutir à des élections anticipées d’ici quelques mois. Erdogan n’a donc pas encore dit son dernier mot. Dans ce chapitre, l’étude de deux lieux en Turquie – le quartier Sulukule et la ville de Hasankeyf – nous permettra d’enquêter sur ces mutations de la citoyenneté à partir des résistances d’habitants qui y sont observées. Le quartier Sulukule, situé dans la partie européenne d’Istanbul, a fait l’objet de projets de transformation urbaine en 2006 et a été détruit dans sa totalité en 2009 ; les habitants ont été déplacés dans une cité nommée Tasoluk construite à 30 km d’Istanbul. La ville de Hasankeyf, localisée à 40 km de la frontière syrienne, est, quant à elle, menacée par la construction prévue d’un barrage hydroélectrique. À travers l’étude de ces deux lieux, l’objectif est de s’affranchir du cadre classique de l’analyse de la citoyenneté et de s’intéresser plutôt aux pratiques ordinaires de cette dernière. La citoyenneté sera donc analysée comme l’aboutissement d’un processus basé sur des pratiques quotidiennes, inventées ou employées par diverses communautés. Il s’agira de voir comment les conflits incitent les communautés à reconsidérer leur citoyenneté et à inventer de nouvelles pratiques qui lui sont liées dans le cadre de leur quartier, notamment par des rituels culturels. Comme ces résistances émergent dans des lieux ethniquement ou politiquement stigmatisés par différents types d’acteurs (institutions publiques, forces de police, médias, opinion publique, habitants d’Istanbul, habitants des quartiers eux-mêmes), nous chercherons à savoir si le lieu de vie, en s’articulant avec une identité ethnique, constitue un support pour créer une résistance face à des menaces venant de l’extérieur. De ce fait, notre recherche soulève de nombreuses questions : peut-on parler d’une forme de citoyenneté urbaine dépassant le cadre institutionnel de la citoyenneté ? La ville constitue-t-elle un espace dans lequel les minorités mettent en place des processus d’affirmation identitaire face à une perception nationale de la citoyenneté qui renie la diversité ethnique et refuse toute manifestation publique des appartenances ethniques et religieuses ? Pour répondre à ces questions, nous nous référerons aux recherches qui tentent de relier la citoyenneté à la ville, et en particulier aux notions de droit à la ville (Lefebvre, 1968) et de justice spatiale. Nous chercherons à comprendre l’articulation entre ces concepts et à observer les formes sous lesquelles la citoyenneté se manifeste dans la vie quotidienne des habitants. Nous verrons qu’elle s’incarne dans de nouvelles formes d’expression dans la ville lorsque certains de ses habitants sentent leur lieu de vie menacé, car il représente une partie de leur identité spécifique. Cette citoyenneté ne prend pas nécessairement la forme d’actes « héroïques » étudiés par Işın et Nielsen dans leur ouvrage Acts of Citizenship (2008), mais se manifeste davantage par des pratiques et rituels quotidiens, souvent invisibles de l’extérieur et non-médiatisés. En plus des formes classiques de mobilisation collective comme les meetings, les manifestations, les barricades et les campagnes de pétition, une résistance basée sur une « culture subalterne » (Scott, 2009) apparaît, par laquelle les habitants expriment leur citoyenneté. After the publication of his recent book Implosions / Explosions. Towards a Study of Planetary Urbanization. Professor Neil Brenner, an american urban theorist, exposes in a lecture given at the University of Melbourne in March 2015 his major research including processes of urban and regional restructuring and uneven spatial development; the generalization of capitalist urbanization; and processes of state spatial restructuring, with particular reference to the remaking of urban, metropolitan and regional governance configurations under contemporary neo-liberalizing capitalism.